For the reduc­tion of weight the concept of „Damage Tolerant Design“ has been success­fully imple­men­ted in the aerospace industry since several decades. This concept is based on the idea, that a certain amount of defects can be toler­ated in a struc­tural compon­ent, before it has to be repaired or exchanged. To guar­anty the struc­tural integ­rity of such a compon­ent continu­ous non-destruct­ive inspec­tions have do been done, lead­ing to down times of aircrafts. 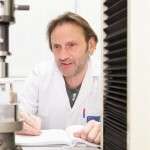 In addi­tion the amount of struc­tural compon­ents made of CFRP has been increased strongly in the last decade, but their poten­tial has not been exhausted due to uncer­tain­ties in the produc­tion process and the predic­tion of the resid­ual life (higher safety factors compared to metal struc­tures). If such a non-destruct­ive inspec­tion system could be perman­ently applied to struc­tures of interest espe­cially to compos­ite struc­tures and oper­ated online (Structural Health Monitoring), espe­cially in distrib­uted and diffi­cult to access areas, a strong reduc­tion in the down time and subsequent costs of main­ten­ance and also a reduc­tion in weight could be expec­ted. Besides the monit­or­ing of the usage, process monit­or­ing of auto­mated produc­tion process such as resin infu­sion of poly­mer compos­ite struc­tures became import­ant. Therefore concepts for integ­rated process- and struc­tural health monit­or­ing for high qual­ity struc­tures are required. AAC is devel­op­ing meth­ods and sensors for produc­tion process monit­or­ing as well as concepts and algorithms for the off- and online damage detec­tion, quan­ti­fic­a­tion and resid­ual life time predic­tion for compos­ite struc­tures based on pass­ive and active ultra­sonic meth­ods like Acoustic Emission, Guided Ultrasonic Waves and Phased Array Ultrasonic waves together with local strain approaches meas­ured by distrib­uted fibre optic sensors.